Today we’re going to talk about protecting your home from subterranean termites and a little about community responsibility. 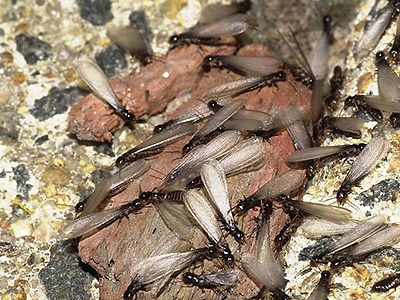 There are several species of termites in Southern California that property owners and managers need to watch out for. Drywood termites are the most common in our area, with subterranean termites right behind them. What are subterranean termites? Do they pose a threat to SoCal property owners and managers? Yes they do! In fact subterranean termites are in plague proportions in central and southern parts of California. Older urban areas of the San Francisco Bay Area, Sacramento, Reno, Fresno, Los Angeles, Orange County, San Fernando Valley and San Diego are particularly vulnerable. When a termite infestation takes hold of a property, it’s like a ticking bomb. At any moment the devastation can become apparent. To make matters worse, adjacent properties can be affected as well. Left unchecked, that initial infestation will spread to the surrounding structures in a relentless fashion as the colony of termites matures and swarms. What affects one structure will, in time, potentially affect all surrounding structures. So defend your home against subterranean termites. Keep alert for signs of infestation. Don’t put off termite treatments, but prioritize protecting your home. After the initial treatment, make sure you maintain a yearly service contract. And talk to your neighbors about the need for them to protect their homes as well. Of course the best action you can take is to get a free termite inspection from a professional termite control company.